We have the potential to be a $10 tn economy in next 20 years if we encourage manufacturing and innovation in select sectors, writes D. Shivakumar, CEO of PepsiCo India. ABOUT: D. Shivakumar is the Chairman and CEO of PepsiCo India. Tasked with overseeing the investment of Rs 33,000 crore by the company in India by 2020, Shiv, as he is better known, keeps a tab on the policy landscape to carefully choose which markets -geographical and product-wise - to dive into. Prior to his current role, he led Nokia's business here when it was India's largest MNC operation. 'Make in India' has caught the imagination of business houses, media, and investors. It is difficult to say with certainty that this has turned into tangible Foreign Direct Investment (FDI) inflows or high intent to set up manufacturing projects in India. 'Make in India' is a powerful concept. India will be a large consumer market, one of the largest business-to-business markets and one of the largest businesses-to-government markets in the world. Very few countries have scale in all three areas. India also has a large base of entrepreneurs. 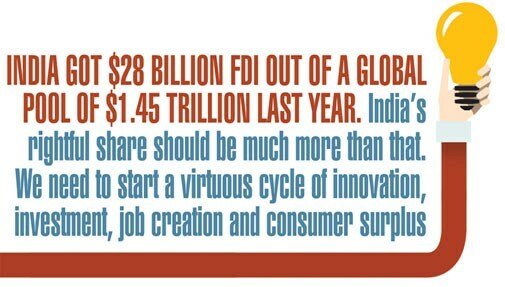 All this makes India a perfect role model for frugal innovation in emerging markets. India is a $1.9 trillion economy and at current growth rates we will be around $6 trillion in 2034. We have the potential to be a $10 trillion economy in the next 20 years if we encourage manufacturing and innovation in select sectors. We will need to create a million jobs every month in the course of this journey.We need to do six things if we want India to be an innovation leader for emerging markets and a $10 trillion dollar economy by 2034. Branding will be integral to this journey. We cannot be a low-cost producer of goods and services forever. We will need to move up the value chain and use technology, consumer insights and brands to capture value via innovation. This will need a different mindset. This will mean a move to design thinking, to think sensory appeal, to think the concept of consumption and enhancing the value in packaging. India is weak on a number of these dimensions because we have historically placed price, distribution, efficiency and market capitalisation ahead of creativity, business models and brand value. We will need to rethink the ecosystem. This will require an active shift in thinking the complementariness of big and small as opposed to an opportunity limiting big versus small paradigm. India is a big market for most goods and services and will be a bigger market this decade. We need to think scale on this journey. Encouraging sub-scale activities will not generate value. We need to develop ecosystems where the big and small work together to build scale. This principle is relevant in FMCG, automobiles, electronics, telecom and many other categories. The German model of big and small companies working together in their competitive automobile ecosystem is a good model. India has close to 50 million MSMEs (Micro, Small and Medium scale enterprises). Ninety-five per cent of MSMEs employ less than 10 people, and the remaining five per cent employ between 10 and 100 employees. These MSMEs are rich in ideas and initiative but poor at accessing capital and human talent. The government has set aside Rs 10,000 crore in the last budget for MSMEs. This is a good start. 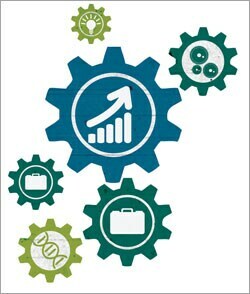 MSMEs in the technology area have high management capability but in other areas, the big companies will need to help the small ones build capability. If a nation wants to be innovative for the masses, mobile technology is a must. India has the second-highest base of digital products in the world. A smartphone coupled with UID (unique identification), low data charges and easy access to the Internet will be a boon to innovation in business models. A mobile business model will be a default business model in India and the country will be the gateway for this revolution. Africa and many emerging markets will leverage this after India. Technology can play a positive disruptive role in health and education services. India's investment in health and education is less than four per cent of GDP and an old brick-and-mortar approach to these two sectors will need billions of dollars. Infusing technology here is the innovation and this innovation again has legs to sprint not just to emerging markets but developed ones as well since every country grapples with the same problems. India can be the hub for breakthrough value innovation in durables. The small car will be the start. When India and Tatas master the small car, they will set off a revolution in many other durables. This concept of frugal but efficient durables will be a significant theme of the future. This will need India to redevelop its industrial and technical training Institutes and will mean a significant overhauling of the current analog curriculum to a new digital one. This digital capability will flow into services too and India will be uniquely placed in the world to offer a good mix of digital and physical services in the requisite sectors. India also has the ingredients to be a hub for small passenger jets. India has a strong base of institutions for higher education and scientific studies. We could encourage cross-fertilisation of ideas and open these higher-level institutions to business. This will be a big plus for India since only a few countries like the US and China can leverage similar advantages. This unique connect and develop model can be a source of leverage and a gateway to emerging markets looking for a support system. Innovation needs diversity and India has rich diversity. We will have three generations in the workplace this decade and that will give us a significant balance and advantage. Our ability to tap into the base of talented women will be a model for emerging markets. Our ability to tap into the wide spectrum of socioeconomic and cultural groups will be another advantage for Indian innovation. India will not have all the capital or savings needed for this investment. According to the World Investment Report 2014, India got just $28 billion FDI out of a global pool of $1.45 trillion last year. India's rightful share should be much more than that every year. We need to kick start a virtuous cycle of innovation, investment, job creation and consumer surplus. India is well placed to harness most of the enablers. If we do this right we could translate 'Make In India' to 'Innovated in India' by the turn of this decade.